This multilayer dessert of fruits, custard and jelly is enjoyed by one and all! Drain the syrup from the fruit cocktail and lychee cans, mix the fruit and lychees in a bowl and keep aside. Boil the milk in a saucepan. 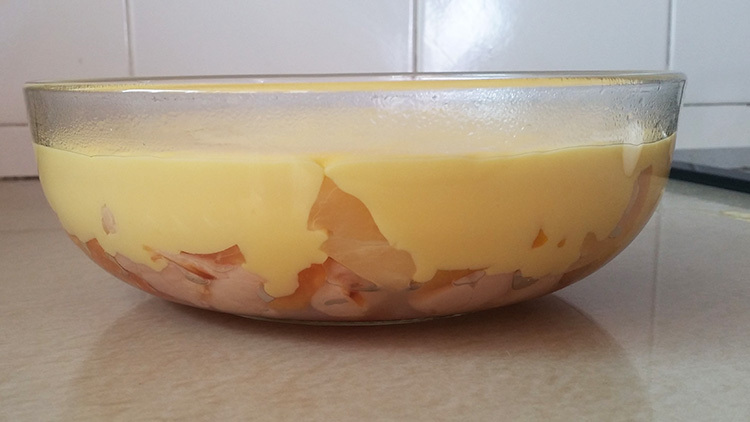 Once the milk is boiled, add the sugar and custard mix into the saucepan. Slowly stir on a low heat until the mixture becomes slightly thick. Pour the custard-milk mix into the bowl of fruits. Let the custard set for 15 minutes. Meanwhile, boil 370 mL water and add the strawberry jelly powder while stirring slowly. Pour jelly mix over the custard. Allow the bowl of trifle to cool in the fridge before serving.